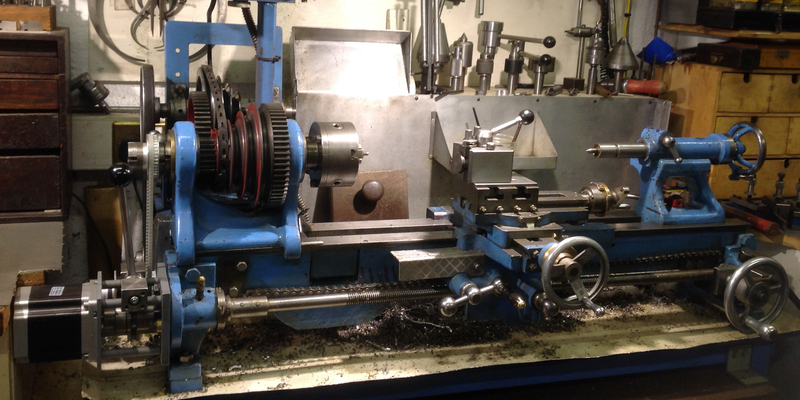 Of conventional design - a flat-topped bed with V-edged sides and a deep, detachable gap, backgeared, screwcutting by a train of changewheels and with a compound slide-rest assembly - this antique lathe has been extensively modified to make it a perfectly useable and accurate machine for daily use. Built in the period circa 1885 to around 1910, this was a time when many makers - literally dozens of them - failed to put any identifying marks on their products. This may have been due to modesty - but more likely because they were factored or resold through large agents and dealers who insisted on attaching their own badges. It looks as though a chain has been used in place of a rack for the carriage hand feed, though this might be part of a power-drive system - a not uncommon fitting in earlier decades and indeed, even to be found as late as the 1970s on one model of the Denford Viceroy range sold to training establishments.